You are sure to enjoy any camping adventure when you choose to camp with this triple slide out Volante 320IK fifth wheel. In the kitchen and living area there is plenty of room to do a little entertaining. Here you can whip up a few snacks or favorite meals for your crew in the spacious kitchen which features a large island with a double sink and still be included in the conversations among your friends who are in the living area sitting at the sofa or the theater seats. At night head up to your quiet retreat in the private front bedroom where you will find a queen bed plus a full wall wardrobe for all of your clothes and more! 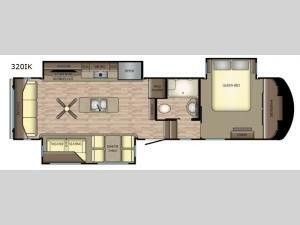 The CrossRoads RV Volante fifth wheels are anything but ordinary! From the residential wood blinds in the living room, the premium residential furniture throughout, to the LED lights with LED accents lights in the slide outs you will be impressed from the minute you enter these fifth wheels. In each kitchen you will find stainless steel appliances such as an XL 50/50 sink, microwave, and oven. Along the exterior there is a fully enclosed and heated underbelly, an outside shower which makes it easy to clean up before heading inside, and tinted safety glass windows.